Wool Pets 1024 - Easy to follow step-by-step photo instructions provided in the Woolpets kits will guide you through the technique of needle felting. Most projects take less than two hours to complete. All you do is fluff the wool, roll it into shape and poke - the more you poke the denser the wool becomes. How does it work? Wool binds when heat and friction are applied. 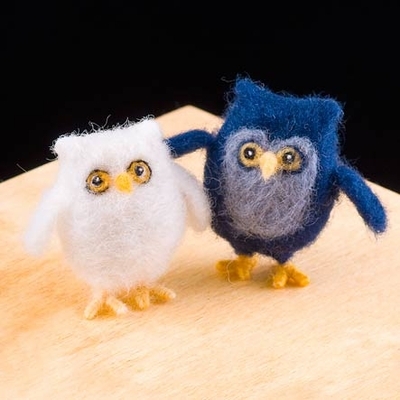 Woolpets provides a super cool way to learn the art of sculptural needle felting. What's included: White, gray, yellow and blue Corriedale wool, black Merino wool, a pipe cleaner, two new felting needles and detailed photo instructions. Makes how many: Kit makes two owls, approximately 2.5" to 3" tall.